Here we are at Calgary Marathon time again! I would love to have been getting ready for the 50k, but I find myself nervous about even running the Half. This year has been tough. BUT that means things can only get better. I definitely need a solid enjoyable race and that will be my goal for Calgary. I'm not setting a time goal. Maybe I'll even pause to absorb the East Village fun for the first time ever. 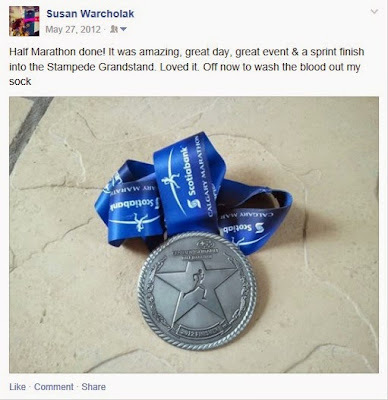 This will be the 3rd anniversary of my first ever half marathon, I would love to recapture some of the crazy energy and finish the race with the same excitement. I do not however, need a repeat of the nuclear blister. Since then I've run a few more races and have realized I absolutely want to keep running for as long as I am able. I know I'll work through my current issues because it is worth it. Running makes me happy, in 2012 I was so happy I didn't notice my legs had gone numb with the cold. I'm also pretty excited to run the Half AND 5k next weekend, in fact a bunch of us are doing exactly that. It's going to be awesome! It's time to celebrate why we run. I get all serious about setting myself a goal, but make sure to celebrate too. Seize the moment. I wish I could be there to cheer you on! Run strong. We'll miss you this year, last year was all the fun :) ONWARD!